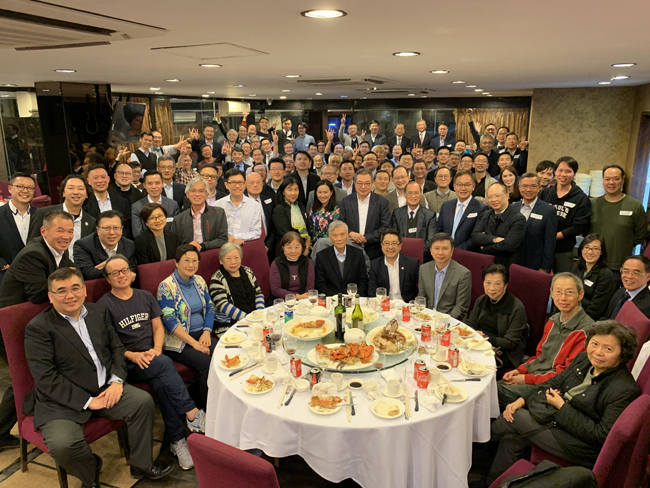 The St. Paul’s College Alumni Doctors’ Group held a dinner gathering in Lei Yue Mun on Wednesday, 13 March 2019. The evening was celebrated with the highest-ever attendance of members in the group: a total of 112 alumni doctors and medical students were present. Also joining the dinner were Principal Mr. Dennis Yuen, Dr. Ian Chan (Chairman of the Campus Enhancement Project Fundraising Committee), Mr. Michael Mak (Headmaster of our primary school), Mr. Timothy Ha (former Principal from 1968 to 2006) and former Vice-principals, Mrs. K.C. Too and Mr. H.W. Wong, together with several retired teachers. The gathering opened with Mr. Ha addressing the alumni before all the attendees sang the College Song together. Mr Dennis Yuen, current Principal, then spoke of the new educational initiatives at the College and the latest progress of the campus enhancement project. The alumni were also brought up to date by Mr. Mak about the diverse learning experience in our primary school. It was a delightful occasion for our medical alumni to reconnect with their teachers and old friends, as well as to get to know about the latest developments of their alma mater.